I saw this article called Supreme Court Case on Baby Bells May Affect Antitrust Enforcement in Tuesday's Wall Street Journal and my reaction was - of course they did everything they could to stifle competition; the problem is, as the article points out, is to prove it. I didn't spend much time on the old AT&T's local side of the business and from 1996 (Telecommunications Act) through 2000 I was either wireless/LD bundle boy or implementing AT&T's consumer online marketing strategy*. However, as wireless bundle boy I was often in meetings with the managers of the local offers who tried to convince me to add local into my marketing mix; unfortunately, I didn't agree because it was hard enough selling wireless plans on the phone let alone adding in local. So, that's a long way of saying that I didn't have the plans and don't have any documentation, but here's what I do remember. In the early days of the Telecom Act, AT&T tried to resell local service in very competitive states like Connecticut. However, AT&T was buying the service from the LECs at retail rates with a discount on top of it and then offered this bundle to residential customers. Basically, an expensive white label product from AT&T's enemy at the time. Of course when you lumped marketing and promotional costs on top of this product, AT&T quickly started losing money. And, when C. Michael Armstrong came in as AT&T Chairman, this practice stopped and then we move to selling local service via UNE (unbundled network elements or buying individual parts of the local service and then repackaging them). The LECs then tried to set their own resale prices to force AT&T out while capturing the long distance market. I left in June 2000, but in the end we know what happened which was MCI collapsed due to playing with their books and the old AT&T stopped marketing to residents to pretty themselves up for purchase by SBC which formed the new, new, new, really it is new AT&T. For a little more history, check out Armstrong's speech given to the Senate in June 2001 on the state of telecom competition. This reminds me of two stories. One was back in 1997 when I interviewed for a marketing position with Teleport a competitive local company for businesses headquartered in Staten Island. Besides being very late for the interview because of a major accident on the Outerbridge Crossing, I took one look at a US map of their local service and thought to myself, AT&T is going to buy Teleport and I'll end up right back where I started. Of course, when the CMO asked me what I thought of the company I mumbled something about the commute instead of telling him the truth. The second story had to do with sticking it to a Division Manager named Andy M. who was walking along the long third floor corridor on his way to see then head of Consumer Long Distance Jack McMaster when I caught up with him. I was also on my way to see Jack to talk about career plans when Andy decided to smugly tell me that I was sure to get bumped because he had more important things to discuss with Jack namely to brief him for his meeting with Armstrong on AT&T's 7 (or 9) State Local plan. Jack of course took the 15 minute meeting with me and we talked about the Yankees, my career, a promotion, and general guy talk. 6 months later Jack made good on his promise and promoted me to Division Manager. Anyway, back to the article. So while I have no concrete p roof, I saw from AT&T's perspective the LECs putting up stumbling blocks. At the end of the day what really matters is local competition right? Well, according to this chart from the FCC local competition peaked back in June 2004 and now is on a downward trend. 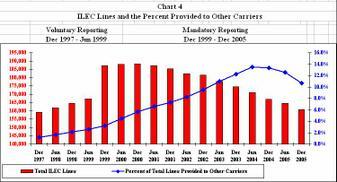 And, that peak reached 14% of all lines nearly 8 years after the Telecom Act of 1996 was supposed to foster competition. Think it doesn't matter now with VOIP, wireless, cable, and etc think again. The LECs get pricing power without any real competition and that really gets to the heart of the Net Neutrality Issue.